One of the reasons I started this blog was the idea that in forcing myself to write regularly, I would also keep my own skills sharp and learn some new things. That has certainly been the case with learning about Carolina Wrens, and in particular a couple that has decided to nest on our deck. Last year, we had a pair of wrens move into a birdhouse one of the boys built as a Cub Scout project. 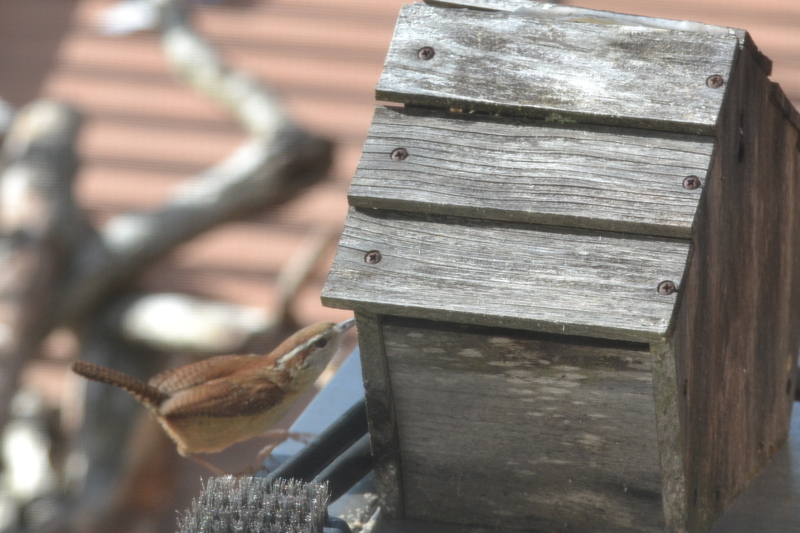 It was a simple house, hung up under th e eave of our screened-in porch, and the wrens moved in secretly, and quickly. Carolina wrens are very common, nesting almost everywhere in the continental US through the summer, and through central and South America year-round. They aggressively seek tree cavities to nest in (even driving other birds off), and readily – as I’ve learned – use nest boxes and other cavities such as old boots, boxes, flower pots, etc if they can get into a shed where these items are! Disappointing. They’d have to find another spot this year. Fast forward to a couple weeks ago. For reasons I can’t remember, we had a mostly-decorative birdhouse that had been on a tree and never used. I had pulled it down, and absent-mindedly left it sitting on our gas grill. One evening, cooking on the grill, I noticed that the birdhouse was split right down the middle, nearly completely in half. The reason – it was stuffed with nest material, in a very familiar pattern. In fact, there were 2 eggs in there as well! The next day, I noticed 4 eggs! But I still hadn’t confirmed that “our” wrens had come back. I wasn’t sure whose eggs these were. Given that the roof line of this house was completely split, I’ve been concerned that this nest was going to fail, particularly with the hard rains we’ve been having with typical spring storms. BUT, this morning I caught her – it is the wren, she’s on the nest, and things are apparently still going well. I’ve seen 4 eggs, but there may be more (Note, as of May 7, there are FIVE!). Given a typical incubation period of 9-16 days, we can expect chicks anywhere from this Tuesday (May 9) to about a week later. We’ll keep watching! As an aside, as I was researching incubation periods on Cornell University’s All About Birds site, I came across this tidbit: Later in the season, wren nests become infested with mites and other parasites that start to feed on the chicks. Cause and effect isn’t necessarily clear, but wrens will sometimes include spider nest sacs in their nest material. Apparently this has been studied in the lab, and when the baby spiders hatch, they devour the mites without bothering the wrens! Another fascinating example of symbiosis and animal ingenuity!